This topic contains 2 replies, has 2 voices, and was last updated by Samuel 2 years, 3 months ago. Did you use a child theme for customizations? Also, did you create a back up? Some hosting companies provide free back up, please find out from your hosting provider. We might be able to restore that back up if you don’t have one. 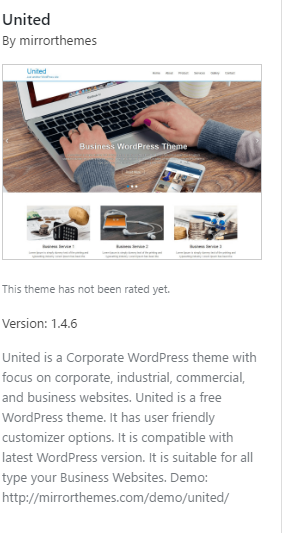 Here is what I discovered – there is another theme called United – some how wordpress thinks I should update the theme and when I do it installs/replaces the Untied Theme by Mirror Themes with your theme. So all is working well now, thought you’d want to know what happened.